Hate speech codes are a bad idea, but it’s a mistake to ignore the harmful effects of hateful and bullying speech. According to the authors, “free speech advocates must acknowledge the admirable values that tempt people toward censorship, and then provide a road map for addressing these issues in a way that does not undermine higher education’s necessary commitment to free speech, academic freedom, unfettered inquiry, and robust debate”. They offer a series of cans and can’ts, or shoulds and shouldn’ts for private universities. Here are the highlights. Faculty members may choose to provide students warnings before presenting material that might be offensive or upsetting to them. Colleges and universities should not, however, impose requirements that faculty provide such “trigger warnings”. Professors need to decide how to best educate their students without being micromanaged by the administration. In some cases a professor’s judgment might be that being exposed to disturbing material without warning will make for more effective instruction. Besides, understanding cuts both ways. Just as professors should not be tone deaf to the feelings of their students, students need to prepare themselves for the real world where they won’t be coddled. Campuses should create “safe spaces” in educational settings that ensure that people feel free to express the widest array of viewpoints. They should not uses the concept of “safe spaces” to censor the expression of ideas considered too offensive for students to hear. Put simply: you go to college not to learn things which comfort you, but to learn things that shatter you out of your comfort zones. That’s what education is about. Campuses can sensitize faculty and students to the impact certain words will have, as part of an effort to create a respectful work and learning environment. But they should not prohibit or punish faculty or students from using words that some consider to be examples of “microaggressions”. We should all listen when others tell us they feel insulted and hurt. 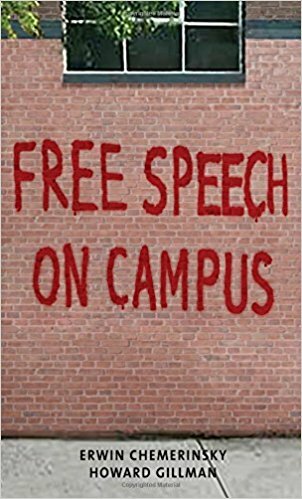 Campuses should expect university administrators to speak out against especially egregious speech acts and intolerance as a way of demonstrating the power of “more speech” rather than enforced silence. They should not expect the administrators to comment on or condemn every campus speech act that some person considers offensive. It’s cliche by this point, but a lesson that’s being lost, that the best remedy for speech we don’t like is more speech — robust counter-speech that rigorously challenges what we object to. Protect the rights of all students to engage in meaningful protest and to distribute materials that get their message out, while at the same time preventing disruptions of university activities. Ensure that campus dormitories are safe spaces of repose, short of imposing content-based restrictions on speech. Establish clear reporting requirements so that incidents of discriminatory practices can be quickly investigated and addressed. Encourage faculty and students to research and learn about the harms associated with intolerance and structural discrimination, and sponsoring academic symposia. Organize co-curricular activities that celebrate cultural diversity and provide victims of hateful and bullying acts the opportunity to be heard. In the final chapter we’ll see what’s ultimately at stake in all of this.